Jesus wants his followers to come to complete unity; this oneness that exists in God, a triune God with three persons (Father, Son and Holy Spirit) They are one. Unity among Christ’ followers reflect the unity of our Creator. When people saw Jesus; they saw God. Jesus’ prayer is that through the unity of the church people could take a glimpse at who God is. When the church is united there is evidence of God in their midst. Unity among Christians is a powerful testimony in the world. (“That the world may believe that you sent me”)v.21. Disunity testifies against Christ in the world. However, unity is a powerful testimony. Jesus said, the world will know you are my followers if you love one another. Here he said, the world will believe in me when they see you united; it will be evident to them. Unity testifies to the identity of Jesus as the Messiah, Savior and Lord. Why would the world believe our message when they see more separation than unity among God’s people? Scripture talks about our union with Christ which was made possible by his death on the cross. Eph.2:14-17 Jesus made it possible for everyone to be able to be brought near God and united as one body. He created one new “man” out of two distinct groups Jews and Gentiles. They became one in one body. All those who were baptized into Christ are children of God. Our faith and baptism unites us with Christ. Once we are united with him then we are also united with each other. In Christ there is neither Jew nor Greek, slave nor free, male nor female for we are all one in Christ. Unity in diversity (There were not the same, they were all different, they had different functions and abilities and came from different backgrounds and ethnicity, but in Christ Jesus they can be one family, one body.) This is what the world needs to see and it must be the church that would model this complete unity. Jesus prayed that his people become one so that the world may believe in him. In a team, the members don’t play the same position, they all have different shapes and sizes, they all come from different places, but they all come together for a common purpose. The success of a team is attached to their playing together, through their unity in spite what they go through during the season. The church is God’s team in the world and if we don’t become one, we will fail at accomplishing Christ’s mission. Scripture teaches us that Jesus himself gave us leaders in the church to train us for the work of service (ministry) for the purpose of building up the church. The goal of this training is for people to reach unity in the faith and unity in the knowledge of Jesus Christ becoming mature, attaining to the whole measure of the fullness of Christ. Unity in faith and knowledge of Jesus is a sign of growth in person. Disunity is a sign of being still an infant in the faith. Disunity doesn’t help building up the church, it reflects how immature a person is in the faith. Unity among believers is evidence of growth. They are becoming like Jesus. Jesus prayed for his followers to become one in the world. The world will believe Jesus when they see God’s oneness in us. May they be one; may they all be brought to complete unity. Has Jesus’ prayer been answered today? Today you and I have the chance to make this prayer a reality in the world; by displaying unity among each other. When the world sees us united, they will see evidence of God in our midst. 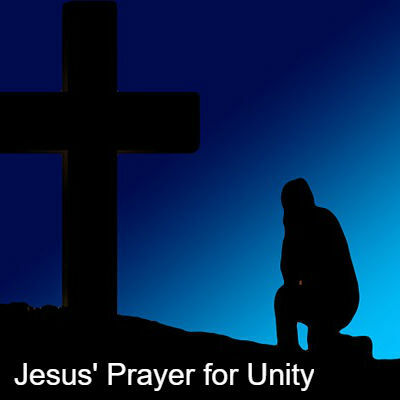 May God’s people come to complete unity so the world would believe in Jesus.